The ASM1 Submachine Gun in Call of Duty Advanced Warfare reduces its fire rate after you start firing but at the same time the recoil settles too. It has the most damage in the Submachine Gun class. It is best at medium range where you are competitive with assault rifles. However, it has very bad iron sights that make it difficult to spot and keep on enemies. The Red Dot Sight is a must have on the ASM1 due to its bad iron sights. 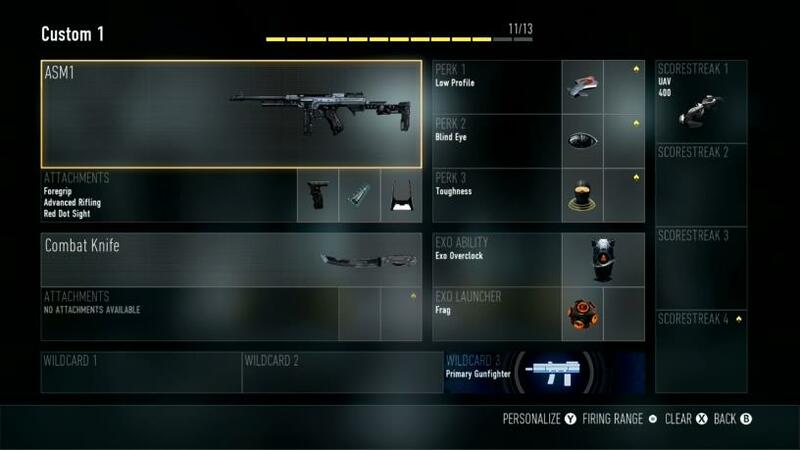 The Advanced Rifling increases the range of the ASM1 making you even more competitive with assault rifles. To keep the ASM1 under control under sustained fire use the Foregrip to reduce recoil. Use Low Profile to stay off enemy UAVs and Blind Eye to be invisible to enemy air support. Toughness is a must on every class since it reduces flinching when you are being shot at making it easier to win a contested gunfight. To get back to enemies quickly after dying use the Exo Overclock ability. Also equip your favorite grenade, such as a frag grenade. Here is the complete recommended class setup. There are 3 points for you to spend on the scorestreaks you want. This entry was posted in Call of Duty Advanced Warfare and tagged Advanced Warfare, ASM1, ASM1 Best Attachments, ASM1 Best Class Setup, ASM1 Best Loadout, ASM1 Best Perks, Call of Duty, Call of Duty Advanced Warfare. Bookmark the permalink.